It's a fact - athletes have to train both in-season and during the off-season for optimal performance and to help prevent injury. Unfortunately, most athletes do not get the proper training they need, which results in fatigue, injury and performance deficits. That’s where RehabWorks Sports Performance can help. We are committed to safe, consistent, evidence-based performance training, not fads and gimmicks. We will develop a unique training plan to help you improve your core strength, balance, and coordination; run faster, jump higher, cut quicker; and build sport-specific strength and muscle. Our personal training program is geared toward helping any individual improve their strength, flexibility, or any other aspect of fitness. When clients come to RehabWorks Sports Performance, we work with them to create a training plan customized to their needs and goals. We pride ourselves in prevention of injury through the use of pre-assessment driven, individualized protocols. However, we also provide athletes with proper rehabilitation protocols post-injury, allowing them a safe and strong return to their field of play. Training programs are available to all ages in small groups or in one-on-one sessions. I wanted to get stronger so that that I could continue to compete and live an active lifestyle. I wanted to try personal training. How long have you been in the program? Great results in many areas. I’m stronger and more fit. Working out with Mark has helped me reach several goals including running 55 miles on my 55th birthday. Mark has been an incredible coach/mentor. Mark works not only the physical but the mental and spiritual aspects as well. After struggling with a misalignment issue that had altered my running form and caused pain through my lower back and right hip/leg, I went to RehabWorks for physical therapy. We quickly learned that a lot of these injuries were caused by core and gluteal weakness. After years of focusing on only running, I had no idea where to start. My parents researched sports performance options and the feedback from others was tremendous. Determined to get back on the track with a competitive edge, I knew I had to give it a try. Not only do I run without pain, my form and endurance have improved. I’ve become noticeably stronger all over my body, and I feel so much more powerful pushing through the final mile of my race even as my competitors begin to fade. Not only did Mark help improve my strength, he also boosted my confidence. From the moment I stepped into the gym, the support and encouragement I received was truly incredible. I feel prepared to successfully transition to running at the collegiate level at AU! Definitely try this program! A lot of athletes want to succeed, but only a few are willing to put in the work that it entails. RehabWorks can help you reach the next level while having fun! There’s not a more positive environment you could put yourself in to reach your goals. I began this program to improve my running but the attention and love that I received really can’t be beat. Mark pushed me to my limits during tough workouts, but he also never failed to check on me before a big race or to stop by to see me while I’m at PT. 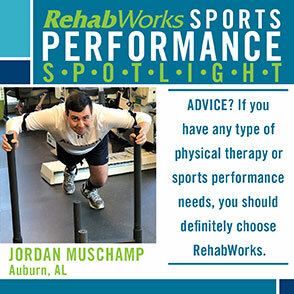 As a rehab tech in the Auburn office for the past for two years, I’ve witnessed first-hand the improvement and success of so many sports performance clients. I talked with Angie about my goals of being healthier and in better shape. We discussed training and nutrition plans to help me lose weight and increase muscle tone and speed. Angie pushes me to my limits every other day on the athletic treadmill and throughout our workouts. I’ve lost about 25 pounds in the past year and I feel like I’m in better shape than I was last year. I’m still working towards my goals and I’m confident I’ll reach them! The sports performance program is not only for post-injury patients or athletes. 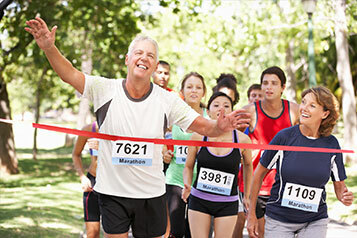 They can help anyone – of all fitness levels and ages – to reach their fitness goals. Mark and Angie are very dedicated, humble and hardworking. They’re also very patient with everyone. They won’t judge you or make you feel embarrassed. Instead, they’ll inspire you to keep working hard. They more than likely will become a part of your family as they motivate you to become even better tomorrow than you are today. As a patient recovering from a spinal cord injury and paralysis, I needed intense physical training to achieve the best outcome. 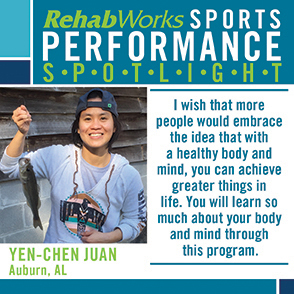 I chose the RehabWorks Sports Performance program based on recommendations by my physical therapist, Tina Hooks, and my pool therapist, Allen Graham. I knew I’d made the right choice when Mark Fuller brought a physical therapist who specializes in spine injuries to my consultation. They asked questions that were important to me such as safety, potential injury-induced limitations and setting personal goals. Since I started working with Mark in September, 2017, I’ve made incredible improvements in my balance, global muscle strength, gate pattern, and most importantly, my confidence. Mark’s worked very patiently and creatively to safely guide and challenge me. His expertise and ability to manipulate exercises that are suitable for my growing abilities has had an amazing impact on my continuous recovery. Mark’s been integral in this process and I can’t thank him enough for the infinite praises of encouragement. RehabWorks provides the assistance and reassurance needed to achieve any goal. 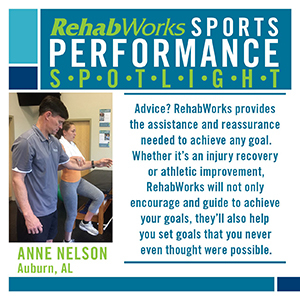 Whether it’s an injury recovery or athletic improvement, RehabWorks will not only encourage and guide to achieve your goals, they’ll also help you set goals that you never even thought were possible. Not only has this program positively influenced me physically, it has influenced me academically as well. As a pre-nursing major with a minor in dance, I’ve incorporated what I’ve learned about muscle health and exercise into a research-oriented, creative scholarship that I presented at the 2018 This is Research: Student Symposium at AU. After taking a year off from college to battle leukemia, I reenrolled at AU and I was referred to RehabWorks by a good family friend who lives in Auburn. I had extensive nerve damage in both of my legs from my treatments that caused the use of leg braces and crutch or cane to help me walk. After spending a few months with my physical therapist, Abby Nielson, I transitioned to the Sports Performance program with Mark Fuller. I’ve been training with Mark twice a week for 6 months. With the help of my RehabWorks team, I’ve regained a significant amount of strength back. I walk completely without a cane and can even partially walk without the use of the leg braces. I’m much more confident in my abilities to get around. I even have some movement back in parts of my ankles and toes! I owe so much to Abby, Mark and everyone else at RehabWorks Auburn who have worked tirelessly to help me get back to my “normal” self. If you have any type of physical therapy or sports performance needs, you should definitely choose RehabWorks. Their team is incredibly professional, encouraging and committed to helping their patients. They always have your best interest in mind. They generally care about you as a person and they’re dedicated to helping you improve so you can reach your goals. I’ve had problems with stability in my knees for over a year. My doctor referred me to Abby Nielson for physical therapy. Abby suggested that I continue to strengthen my quads by working with Angie Lincoln-Velez in the Sports Performance program. Angie has helped me build muscle around my knees and I feel so much better. The exercises have expanded my range of motion and I’m still getting stronger! 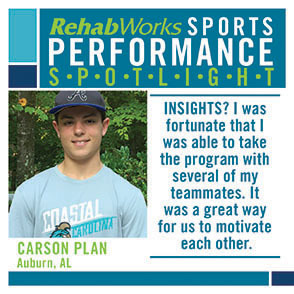 I definitely recommend RehabWorks and the Sports Performance program! The trainers are great. They really care about their clients and help them grow stronger. I wanted a program to help me get stronger and faster during the offseason and I knew Coach Mark would help me achieve that. How long hasbe you been in the program? I have worked with Coach Mark for several years now and I will continue in the future. I have increased my strength and speed as well as other improvements to my overall game. I really see the results on the baseball field. The workouts are designed to fit to your specific needs/sport but the results depend on how much effort you give to push yourself. Workouts with Coach Mark are great and he has helped me become a much better ballplayer. I needed a summer workout program to help prepare me for my upcoming soccer season, while also working on injury prevention. Training with Mark Fuller really helped me successfully transition into playing college soccer. My strength and endurance improved through my workout program. Put in the work and make sure you take your time with each exercise so you can get the most out of every workout. Mark truly helped me make the adjustments with my team workout by customizing the workouts. This program helped me reach my goals while preventing injury. I have worked with Coach Mark Fuller for several years during the Sports Academy’s baseball camps. I’ve really enjoyed working with him. 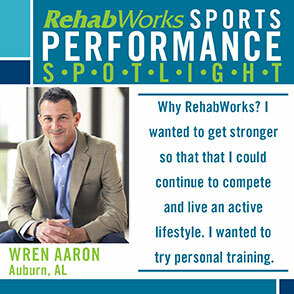 When I learned about the individual workout sessions at RehabWorks to develop my strength and agility, I jumped at the opportunity! This program has made me stronger and faster. I realize that I can do things that I never thought I could if I put my mind to it. I really looked forward to my workout sessions with Amy Rudolph because the activities challenged me and made me push myself. The one-on-one attention made me focus a lot more on my body and performing the exercises correctly. No matter what sport I choose to play, these workouts help ensure that I am doing the best that I can do with my body. Parents: Drew thoroughly enjoyed working with Amy Rudolph. She was the perfect encourager and motivator that Drew needed to push himself each week! I wanted to become faster in the goal and my Mom knew about RehabWorks. After meeting with Coach Mark, I knew I would like it. Coach Mark helped me to improve my strength, speed, coordination, and conditioning through diversified training. Since training with RehabWorks, I’ve been approached by other teams to guest play for them. I’m currently playing on two teams: Opelika Crush and the UMA Hankook Youth Soccer Korean team. Training is hard work, but Coach Mark makes it fun. Parents: Words can't express our gratitude for God bringing Mark into Kasey's life. Kasey's athletic skills have blossomed beyond our expectations. Along with the physical improvements, his confidence has increased tremendously. He’s a much better athlete. Parents - Sam loves to work out and train. We had heard really positive things about the team at RehabWorks and decided to give it a try this past Fall. Sam - My parents asked me and I said yes! Parents - Amy has done an amazing job working with Sam. 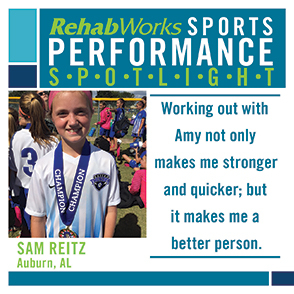 Sam has become both physically and mentally stronger since starting Amy’s program. Sam loves to work out and being able to actually see the results of her efforts has had positive impacts on her overall self-confidence and drives her to work even harder. Sam - I love working out with Amy. She pushes me hard and makes me want to be better. I am stronger and quicker since I’ve started working with her. Parents - If you’re on the fence, just give it a try. Communicate your expectations and with a little work, you won’t be disappointed. Parents - Not only has Amy had such a positive impact on Sam physically, she’s also helped mentally. Amy is a fantastic role model for anyone, especially for our daughter. Sam - Working out with Amy not only makes me stronger and quicker; but it makes me a better person. I love seeing my results and I love that Amy not only pushes me hard but makes the workouts fun and different each time. I’ve trained on my baseball skills with Coach Mark Fuller at the Sports Academy. He told me about the summer workout program at RehabWorks. My grandparents also heard a lot of great stories about RehabWorks and they knew it was an excellent facility. RehabWorks helped me tremendously in many ways. My strength, stamina and agility have greatly improved. I also lost 30 pounds this summer as a result of this program. Have no fears or no worries. RehabWorks is a great establishment that will help you by customizing your workouts to match your specific needs -- while having fun. RehabWorks will instantly make you feel comfortable and at home. 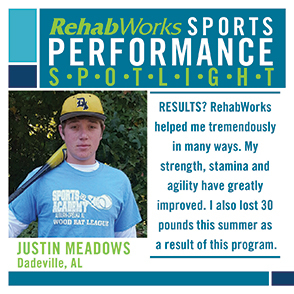 RehabWorks will help you get better. They have a great staff that care for you and make you feel safe. I’ve worked with Coach Mark Fuller at the Sports Academy on various baseball skills since I was 8 years old. 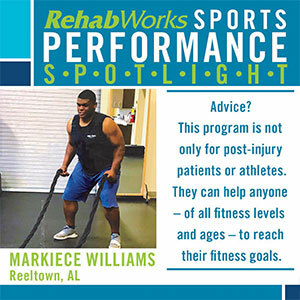 It was a natural fit for me to work with Mark at RehabWorks for the strength and agility training program. He’s very flexible and worked with us to help make the days and times for the program fit our schedule. I have become much stronger, particularly my lower body and arm strength. It also helped me add about 15 pounds. Be prepared to work hard for the full hour of training. I was fortunate that I was able to take the program with several of my teammates. It was a great way for us to motivate each other. I wanted to get stronger and I knew about Coach Mark Fuller’s baseball background. My throwing speed has increased and I’m hitting the ball harder than ever. I also know that I will be better for 7th grade football because I’m stronger. If you want to be stronger for your specific sport, Coach Fuller knows how to make that happen! Parent: I saw significant changes in Harrison’s strength and body image. He’s become more solid and confident. My mom heard that RehabWorks is where athletes that give 110% get that extra 10% so we figured we'd give it a try! RehabWorks helped me become a more fundamentally-sound runner by improving balance, strengthening my core and glutes as well as improving my turnover speed. I worked on the small things with Amy and they made big changes on the track. Definitely do it! You will get results! You're working with the best of the best. They treat you like family -- with a little tough love during hard workouts! They always have your best interest at heart. The one-on-one attention you receive is unmatchable. Every workout is different so you look forward to coming because you don't know what to expect! I had recurring wrist and hip pain from my self-experimenting workout plan. The pain did not go away with medication or other therapy. One of my friends recommended Mark Fuller and the Sports Performance program. Wrist and hip pain went away without even noticing. With Mark’s help, my workouts are more efficient, creative and fun. I’m not usually sore the day after I work out but I’m still gaining strength. I have much better upright posture. Walking uphill is like a breeze. I feel confident playing the sports I like without worrying about getting injured. I wish that more people would embrace the idea that with a healthy body and mind, you can achieve greater things in life. You will learn so much about your body and mind through this program. Sports Performance is not only for athletes or those training for a specific race or goal. Everyone who wants an active life or simply wants to stay healthy should give it a try. It’s a gradual exercise program so you don’t have to be a “Superman” before starting. Mark and Amy will help you get stronger along the way. Get strong while having fun -- why not? 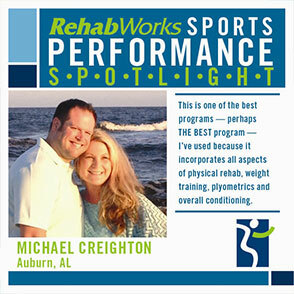 I chose RehabWorks because I’d heard great things about the program. After my initial meeting with Mark Fuller, I knew it would be beneficial for increasing my fitness, strength and overall health. My results were amazing! I gained considerable improvement in my strength and fitness level. I also learned valuable life skills that help me live an active and healthy lifestyle which I still apply to my life today. Try it! It’s different than any other program I’ve tried. It’s the best one I’ve ever done. I’m very happy I did this program and gained so much more than just increased strength and speed. I encourage anyone to try it who’s not only interested in results now, but who are also interested in learning habits and skills that will lead to a lifetime of improved health. Athlete: I wanted to become fit and become a stronger horseback rider and softball player. 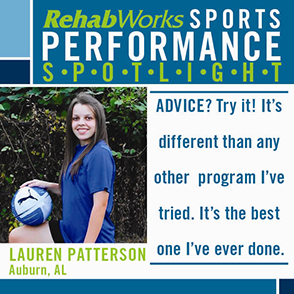 Parents: We chose RehabWorks because we knew the coaches would create a program that would fit her needs as a young athlete. 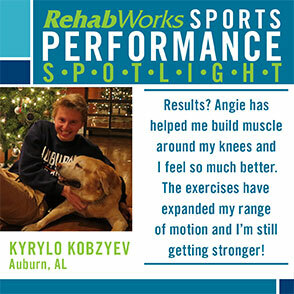 Athlete: RehabWorks is awesome! They created a program that helped me increase my core strength and stamina. When I ride my horse, my posture in my saddle has really improved. I even do better in my P.E. activities and in the pacer and push up tests! 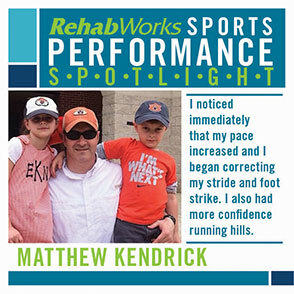 I can run better and longer than I did before I trained with RehabWorks. Parents: As a result of hard work and a program designed specifically for her, Maggie Grace has become a much more confident horseback rider. Overall, her strength has improved tremendously and we can see a big difference in the pride she takes in knowing she can accomplish her goals to perform her sports at her best. 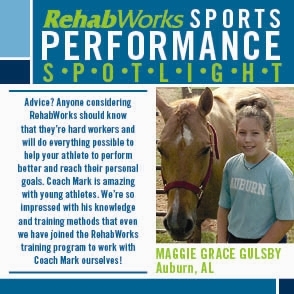 Parents: Anyone considering RehabWorks should know that they’re hard workers and will do everything possible to help your athlete to perform better and reach their personal goals. Coach Mark is amazing with young athletes. 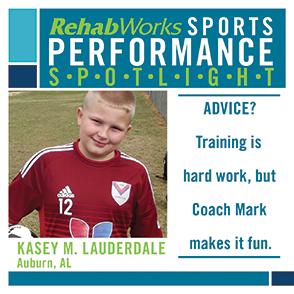 We’re so impressed with his knowledge and training methods that even we have joined the RehabWorks program training to work with Coach Mark ourselves! Parents: Thanks Coach Mark for working with Maggie Grace to build her core strength and her confidence. We’re blessed to have someone like you working with our children and with us! And thank you, Coach Amy, for your help too. You are a great new asset to the team. Athlete: I was looking for a way to increase my strength and speed during the off season while trying to add additional overall bodyweight. RehabWorks provided a training program that met my individual needs. Parent: We looked at different options and talked with Coach Mark. We immediately felt that Coach Mark knew Clayton’s goals and would work toward achieving them. Athlete: My expectations were achieved and surpassed. I have gained weight while building my core, adding muscle, and increasing my ability to get faster. Parent: The program that Coach Mark used worked with Clayton’s body type and built his strength to endure a long season. 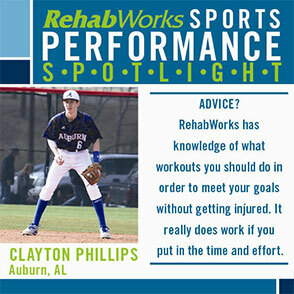 Athlete: RehabWorks has knowledge of what workouts you should do in order to meet your goals without getting injured. It really does work if you put in the time and effort. 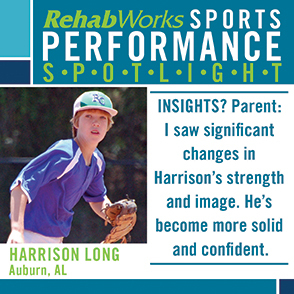 Parent: RehabWorks created a program that not only included weight and core training but also exercises that are specific to a baseball player. Athlete: Coach Mark always made certain that I got the most out of each workout. He would adjust my form to make sure each set was done correctly. Parent: If he missed a workout, Coach Mark always found time to make it up. The workouts were never dull and always challenged Clayton. Thank you Coach Mark. 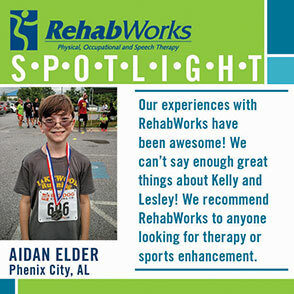 We chose RehabWorks several years ago because Kelly Shaw was the only physical therapist we met that was willing to work to improve Aidan’s condition instead of just passively treating the symptoms. I asked Kelly how we could improve on Aidan’s speed because he was concerned that he ran slowly. Kelly recommended that we work with a running coach and she suggested Lesley Binning with RehabWorks’ Sports Performance program. We could not ask for two finer people to work with Aidan. Kelly has gone above and beyond the call of duty for us as long as we can remember. Even though we’ve only known Lesley for a few months, she’s been inspiring and positive. Our experiences with RehabWorks have been awesome! We can’t say enough great things about Kelly and Lesley! We recommend RehabWorks to anyone looking for therapy or sports enhancement. Parents: To improve his performance and build strength. We also wanted him to learn the proper technique when lifting weights and exercising. We also wanted him to work with Mark because of his excellent reputation of working with kids. Parents: He built a strong core that helps with all of his athletics. It definitely helped with his swimming. He decreased his overall swimming times in every meet which he had never done before. Athlete: My swimming greatly improved! I also was faster and stronger in soccer. Parents: Go for it because you learn a lot of technique that can help you as you develop. It also makes you physically look your best, which helps with the mental well-being. We would recommend this program for anyone. We’re trying to get a group of his soccer teammates to do it with him this summer. Sullivan really loved it and he can’t wait to start training again soon! Athlete: Go and do it! It will help a lot! My employer suggested Sports Performance as a possible workout program. After reviewing the details, I decided to try it! I’m a former athlete and my current job requires physical fitness and agility so I have used numerous workout programs over the years. This is one of the best programs – perhaps THE BEST program -- I’ve used because it incorporates all aspects of physical rehab, weight training, plyometrics and overall conditioning. Training with Mark and Lesley has been and continues to be a great experience. I recommend the facility, trainers and program to anyone wanting to improve their overall health or to train for a specific goal or event. After completing physical therapy with the incredible therapist, Abby Nielson, she recommended that I work with Mark Fuller to regain my strength. When I began the sports performance program, I was still recovering from two concussions. I wasn’t allowed to work out for over a year so I was extremely out of shape and very feeble. Mark helped me regain my muscle strength. He also was very optimistic and encouraging which helped my confidence. I encourage everyone to give it a try. The one-on-one attention helped me quickly progress because Mark made my training regimen specific to my needs. Won the 1600m in his very first meet! Loves football, baseball and has recently decided that basketball and track are pretty great too! 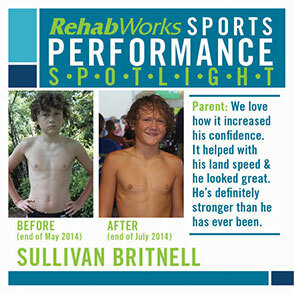 Parents: We chose RehabWorks based on the experiences and recommendations from several others. We wanted to give Jackson a little boost in his agility and leg strength for multiple sports. Athlete: I wanted to become more agile, faster and increase my acceleration for any sport. Parents: Lesley has definitely helped Jackson with his leg strength and endurance, and we have noticed an increased confidence in his demeanor. Lesley has a way of making her athletes feel good about themselves and their abilities, while improving their skill sets for their chosen sport. All sports have a strong mental component and Lesley has done a great job in helping Jack achieve both a stronger mindset and increased physical ability, awareness and control. Athlete: I've become more agile and my endurance has increased a lot! Parents: Lesley has absolutely exceeded our expectations! She pushes Jackson to do more, be better and try harder with each session. She also very attuned to his good and bad days and she makes accommodations. Athlete: Exceeded. Ms. Lesley is very nice and she knows what she's talking about! She knows what will help me improve in each area. Parents: If anyone is on the fence about this type of training, I would encourage them to give it a try. The individual attention and planning behind the sessions are well worth the cost, and with us, the resulting improvements were quickly observed. Although tough, Ms. Lesley's programs are perfect for anyone who wants to improve their performance! Ten years ago, I was an extremely overweight diabetic taking numerous medications. I started exercising and progressed to running. I eventually lost over 100 pounds and I’m not using any medications! My doctor said I have “kicked” Diabetes (type II) and I could be a “poster child!” I’m living proof that with proper diet and exercise, you can improve your health. Running became easier as I lost weight but without this training program, I wouldn’t be as successful. I used to think running was annoying but I now find it very fun and rewarding. Training with Lesley has been one of the best decisions I’ve ever made! Why did you choose our program? I wanted to improve my endurance while running. I had seen results from previous clients so I knew the program worked! My overall performance has greatly been enhanced. My endurance and stamina have increased and my running form has improved. I’m not getting injured like I had in the past. When I started the program, I was just running 5K races. I just completed my first half marathon! My experience far exceeded my expectations. At my age (58), I didn’t think Lesley could do anything with me! But, she has shown me that age doesn’t matter -- if you’re fit. If you follow the program, implement her advice and knowledge, you will be successful. I thought you could just go out and run any race. But, I’ve learned through this program that to be successful and to feel good, you need to understand your limits, know how far to push yourself and when to slow down. You also need to know proper running form. I didn’t realize how poor my form was until I started working with Lesley. Do it -- no matter how old you are! Lesley is a caring and dedicated professional who wants you to do your best. She’s always uplifting--even when slight injuries might slow you down. She knows how to train you through those injuries and how to prevent future injuries. The price you pay for all the time and commitment from Lesley is very little. It’s probably the best investment anywhere for an hour training session! If you’re interested in running, playing competitive sports or any other type of athletic recreation, you should give it a try! 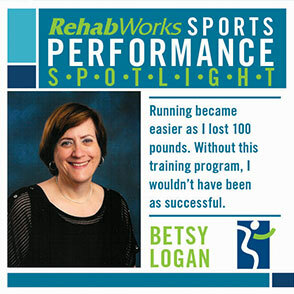 I heard about Lesley and RehabWorks Sports Performance program from a member on my triathlon team. I chose to train with Lesley Binning because of her reputation in the running and triathlon community. Since she’s an athlete herself, I knew she had the personal and professional experience to take me to the next level. I was confident she would be able to get me through any hurdles I would encounter in my training program. My program was designed to increase speed for distance runners. I ran the New Orleans Rock n’ Roll Half Marathon with minimal training when I was about 2/3 of the way through the program. I ran a personal record by over 27 minutes. Training with Lesley gave me the confidence I needed to hold my pace for 13 miles. I have worked with RehabWorks several times over the past 3 years. I’ve worked with Lesley Binning on Sports Performance and with Steve Kisor on Physical Therapy. 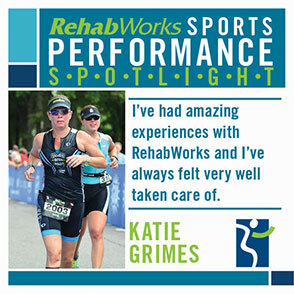 I have always had amazing experiences with RehabWorks and I’ve always felt very well taken care of. Give it a shot! You’ll be amazed with your results. After I finished my first block of sessions, I was so happy with my performance that I asked Lesley to create a follow up protocol to fine tune the results. I’m currently training with her for my triathlon season and I’m excited to see my fitness level this Spring. 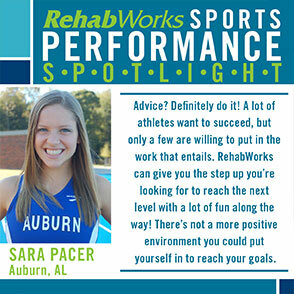 Parent: We chose the RehabWorks based on positive feedback we received from parents of athletes that had gone through the program and based on our previous experience with Mark Fuller when we’ve worked with him at the Sports Academy. Athlete: I wanted to do the program because I need to hit and throw farther since I’m moving up to a bigger field this season. Parent: John’s overall strength, balance, agility, running form and speed have improved significantly. We were most encouraged by the increase in John’s overall confidence level. Athlete: I can throw and hit harder after going through the program. Parent: My expectations were pretty high based on my previous experience with Coach Fuller. Both Mark and Lesley exceeded my high expectations. I was impressed with John’s increased confidence and the noticeable increase in his overall strength. I was also very impressed with Lesley’s ability to improve John’s running form. Athlete: It exceeded my expectations because I wanted to get faster and it worked! 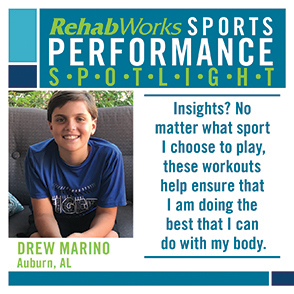 Parent: We definitely recommend RehabWorks Sports Performance to parents who want to help their child improve their overall strength and running form. This program resulted in John gaining confidence as well as increasing his understanding of how to properly work out. Mark is more than just a trainer. He also works with athletes to develop work ethic, leadership and other important character traits during the program. >Athlete: Don’t cheat yourself -- do it right! Athlete: I wanted to improve my all-around strength after suffering an injury to my knee. 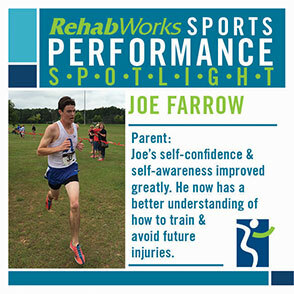 Parent: Joe’s flexibility and overall strength has greatly improved. He had a repetitive injury that threatened to limit his participation in sports. By working with Mark, Joe now has no limitations and he’s enjoying the sports he loves. Athlete: My workout program increased my all-around strength significantly and it improved my running form. I ran 1:21 faster in the 5k than the previous year with a total time of 17:22. I also used this program to prepare me for my military physical fitness test. Parent: Mark more than met our expectations. Joe’s self-confidence and self-awareness improved greatly. He now has a better understanding of how to train and avoid future injuries. Parent: I would recommend Mark and the Sports Performance program to any athlete regardless of ability. Knowing how to train, understanding basic approaches to strength and flexibility and gaining self-confidence are highly valuable, especially for youth athletes. Athlete: Go into it with a mindset that you are there to get better, and it will help you tremendously. Sometimes you get tired and it hurts, but this program has made me such a better athlete and has taught me to push past what I thought I could do. Parent: As a parent, you wish to surround your children with outstanding adults. Mark is one of those people. I'm honored Joe had the chance to interact with him through this process. Athlete: Coach Mark will work with you no matter what previous athletic ability you have. He is very flexible on the types of athletes he works with and he will help you in any way that he can. I was honored to work with him. RehabWorks’ Director, Trip Garner, told me about the program. His wife, Tamera, is one of my best friends and running partners. Trip knew I enjoyed a challenge and that I’m was always looking for a different kind of work out. I jumped on the chance to try something new. I had a specific goal I wanted to achieve which was my overall speed and endurance with an upcoming half-marathon in Birmingham. Lesley placed me in her "long distance protocol" and then tailored it to meet my specific goals. I just completed the half marathon and beat my goal time by 6 minutes! Without Lesley and the program, I don’t believe I would have been as successful. When I run solo or with friends, it’s harder to push myself. When I run on the specialized treadmill using the customized protocol, I run faster than I have ever thought possible. Lesley is also very aware with how you’re feeling (tired, sore, etc.) and she knows when to push you and when to back down. It’s a fun change to a normal workout routine. I would recommend this to anyone wanting to change up their routine and improve their running capabilities! 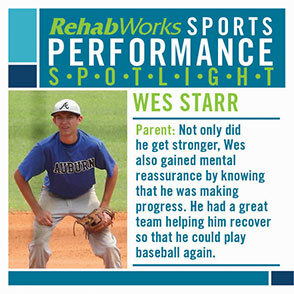 Parents: We chose RehabWorks because Wes injured his lower back. We were told that Wes would never play baseball or any sport again unless he had back surgery. Other doctors recommended that Wes strengthen certain muscle groups to support his lower back. We talked to Mark throughout the injury and we felt like it was the right place for Wes to recover from his injury. Athlete: I really liked the atmosphere and I knew Coach Fuller would help me get stronger. Parents: This program has allowed Wes to play the game that he loves again. The neurosurgeon at UAB Children's Hospital said that his back was more stable than it was before we started the program one year ago. They released Wes to resume all activities without restrictions. 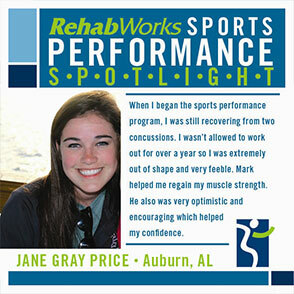 With a treatment plan including RehabWorks Sports Performance, we’re seeing improvements! 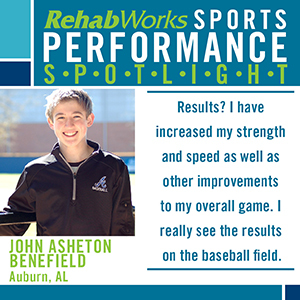 We’re completely thrilled with RehabWorks Sports Performance. Not only did he get stronger, Wes also gained comfort and mental reassurance by knowing that he was making progress. He had a great team helping him recover so that he could play baseball again. 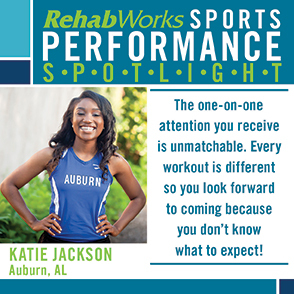 We’re very grateful for our experience and we’re looking forward to working with RehabWorks Sports Performance again. Athlete: Little things were easier and I felt stronger each workout. I knew that Coach Fuller had my best interest at heart. I loved the workouts. They were hard but Coach Fuller pushed me each step of the way. Parents: If you’re considering this workout program, we suggest talking to Coach Fuller. He’s honest and explains the program that he designs specifically for your child based on their needs. I had a knee injury. I wanted to improve technique, posture and form as well as rebuild speed & endurance after the time I took off to recover. I needed a confidence boost & a little more motivation to get started again. How has the program specifically improved your overall performance? It exceeded my expectations. I expected to improve confidence & performance. During the Winter session in 2014, I became pregnant. We appropriately decreased the intensity of that session. Then, I had a miscarriage. If I had not had Lesley during that time, due to depression, I probably would have stopped running. She was constant motivation. Now, I call her my friend. Do it! You won’t be sorry! 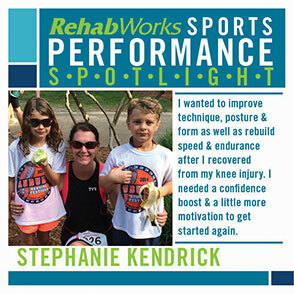 My wife recommended RehabWorks because she had been through the program while training for a marathon. I wanted to improve my stamina, speed, and ability to attack hills. It exceeded my expectations. I felt adequately pushed and encouraged. It helped build some mental toughness needed for training and running on my own. It doesn't matter how young or old you are. I felt like I was treated the same as one of the young athletes coming in to train for competition. Lesley is really good. She pushes you and helps you feel confident without over doing it. She also checks on you and shows an interest in your training.